"Manly" amazing!! I needed a SPECIAL hurray-for-you-message. This YOU'RE AMAZING stamp set of six images fit the bill!! I heat embossed the sentiment in GOLD for an extra punch! The background is the WOODGRAIN Embossing folder. After embossing the Crumb Cake cardstock with the Big Shot Die Cutting Machine, I dragged my Early Espresso ink pad across the cardstock to highlight the texture. VERY guyish!! That's a new word. Thanks for stopping by! Here's a great quick little LUMINARY for a neighbor gift or a special person in a Nursing Home. NO CANDLE needed. Cut out a box using Red Glimmer Paper and the Fancy Favor Bigz XL Die. Stamp JOY on Vellum Cardstock using Jet Black StazOn Ink and let it dry. Working from the back for better visibility, punch out a window using the 2-3/8" Scallop Circle Punch centered on a large panel of the box. Before building the box, attach the stamped vellum to the inside panel with Sticky Strip. Build the box with Sticky Strip for great holding power! Insert a flickering BATTERY tea light. Lovely!! Your gift is ready. Try this quick idea! Don't you LOVE the piney smell of a fresh Christmas tree!?!?! You can almost smell pine when you look at this card! I added Dazzling Details to make the pine cones look frosty. Classic and fast! Time is running out to get holiday cards into the snail mail. This design is QUICK! This is NOT a red card, but yummy Raspberry Ripple color! I'm disappointed in the camera's color. I added Dazzling Details to the flowers and they sparkle when you see them in person. If you'd like more ideas with Serene Silhouettes Stamp Sets, click the stamp name in the right column. I keep coming back to Serene Silhouettes Stamp Set for so many occasions! Here I've paired Pool Party and Basic Gray for my color combo. Very calming. Here is a classy Holiday Tag from a convention display. It really dresses up your gift! And here is the big picture. Notice the stamping on the wide Cotton Ribbon - fun! This cute little punch card was inspired by one I received from my fellow demonstrator, Tami Waddell from CA. NO stamping, just punches! Today is another card from my Christmas Card Stack #2 event. The Illuminate Ink Pad creates a lovely shimmery Bold Snowflake background! I cannot get enough of the Glimmer Paper!! LOVE IT SOOO MUCH!! This is a card from my recent Christmas Card Stack #2. You can almost smell the "piney" fragrance! Look closely and you will see a little frost on the pine cones created with Dazzling Details, a glittery adhesive. I've been making winter Birthday cards with the NEW Single Stamp, Bold Snowflake! Love that this image fits perfectly into the Blossom Punch...No cutting! Look closely to see this wreath is created with Make A Mitten Stamp Set! This clever design struck my fancy at Convention. I'm sorry I don't know the creator to credit. You probably also noticed that the sentiment is in French. Stampin' Up! has been in Canada for over 10 years so this card must have come from French Quebec. This is a fast NO LAYER holiday card. The yellow area is quick sponged. Cherry Cobbler Dazzling Details adds the sparkle! Unfortunately, cold and flu season is just around the corner. I like to keep Get Well cards on hand! I've surprisingly pair FIRST EDITION Designer Series Paper with Champagne GLIMMER Paper to get pleasing results! Purchase Stampin' Up! products HERE. Such a fun holiday card thanks to CUTE Snow Festival Designer Series Paper! Thank you Tami of TamiWaddellCreates for this sparkly Christmas Cheer. LOVE it! Dazzling in person! The "SECRET" to this card: Attach Stampin' Up! 's Multipurpose Adhesive Sheet to White Cardstock and peel off leaving the adhesive on the cardstock. Press on your ribbon scraps, then sprinkle with Dazzling Diamonds Glitter. Dump off the extra glitter and attach the cardstock behind the cut out shape. LOVELY! This background was created using the NEW Illuminate Glimmer Watermark Ink Pad. It makes a tone-on-tone with SHIMMER! It's difficult to photograph, but lovely when you can tilt and tip the image to catch the light. It works with colored cardstocks, also. Did you recognize this image? It's in the VERSATILE Perfectly Preserved Stamp Set of 14 images. This card is so sweet and simple! Couldn't be easier! Purchase any Stampin' Up! products HERE! Nancy's Holiday Special is coming Monday!! The lovely Ornament Keepsakes Stamp Set of 9 images is featured on the cover of the Stampin' Up! Holiday Catalog. Here I've heat embossed one image in Gold. It's such a CLASSIC Holiday card to send your friends! This color combo is Pool Party and Basic Grey, sorry it looks black. A POP of Silver Glimmer Paper is perfect for this simple design! It's harvest time and I miss seeing farmers in the fields of golden crops. This "bundle" of Perfectly Preserved Stamp Set and the Cannery Framelits Dies makes a great fall greeting. Order this bundle now by clicking the SHOP NOW link on the right. This is the lovely NATURAL COMPOSITION SPECIALTY Designer Series Paper! I heavily sponged the paper with Real Red ink and a Stampin' Sponge. The images are pre-embossed on the Designer Paper and resist the sponged color. It's gives a striking result! Knotted 3-1/2" Scalloped Tulle Ribbon adds texture. Confession time: as a northern transplant, I really have trouble getting in the holiday mode - it's just too warm here in SW Florida. I promise to post more holiday ideas starting today! What better way to begin, than Champagne Glimmer Paper!! A Soft Suede snowflake is elegant and stately. Such an easy design to reproduce in mass! Purchase all your holdiay card supplies right HERE! Don't forget to get out my SHOPPER REWARDS in the top right column! You know I LOVE Glimmer Paper! Here it makes a GREAT spooky full moon with an Owl Punch silhouette. The bat was created using the Elegant Butterfly Punch. See my tutorial HERE. LOVE this jar in the Perfectly Preserved Stamp Set! I stamped the jar on Watercolor Paper so I could use an Aqua Painter to achieve a water effect. I added Dazzling Details to the blossom. Lots of November birthdays to stamp this month! Love the way Stampin' Up! "pairs" stamp images and Designer Series Paper to perfectly coordinate! I simply used the colors from the Orchard Harvest Designer Series Paper for my color combo - can't go wrong! A simple card with good impact thanks to that coordinating Designer Series Paper. This is a "simply" impressive holiday card! So easy. I cut TWO snowflakes at once with the Snow Flurry Bigz Die. I LOVE Glimmer paper because it gives HUGE impact! This is a GREAT Halloween Treat pouch! There is a pocket the same size on the backside. Start with paper cut 6" X 6". Designer Series Paper will work the best because it folds and flattens well. Score on the black lines. Stampin' Up! 's Diagonal Plate and Simply Scored make this project FAST and accurate! I used Polka Dot Parade Designer Series Paper. Fold the sides into the center. Fold in half with the pockets facing out. No adhesive is necessary. Punch a hole at the top thru both layers at the same time, then tie with ribbon. I added an optional little Black Cat tag. Add candy or gift card. This is a fast, simple little treat pouch for any holiday: hang on a /Christmas Tree, use as a table favor, or send thru the mail in a Stampin' Up! medium envelope. Create your own mitten design WITHOUT knitting needles!! MAKE A MITTEN stamp set is sooo flexible and fun, especially when paired with the coordinating MITTEN BUILDER PUNCH! This close up shows the vintage detail achieved when you run the Core'dinations Card Stock through the new Holiday Frame Embossing Folder. Happy memories of mittens I have knit over the years! This creation features the In Color Designer Series Paper STACK! It's a great way to have lots of designs in the same color. I love these little flags topped off with a handsome Brushed Bronze Designer Button! What do you think of my FIRST YouTube video?? Hope you will share it with ALL your crafty friends! This cute card was created by Shari Ball, my friend and fellow demonstrator from Illinois! This card features the Peekaboo Frames Bigz L Die for the Big Shot Die Cutting Machine. Here is an idea for the darling 1/4" Sweater Trim in the Holiday Catalog. I ran a thin bead of Tombow Multi-purpose Liquid Glue along the outside edge of the Gumball Green cardstock circle. Then I laid the Sweater Trim on top of the glue circle. AFTER it had dried, I tied a square knot and trimmed the ends. Quite simply! It adds great wintery texture to this holiday greeting!! The Sweater Trim comes in Cherry Cobbler (shown), Gumball Green, and Whisper White. Its also a nifty way to tie on holiday tags! Here is a cute swap from summer Convention created by Candas Freeman of AZ. The Googlie Eyes make me giggle! Here is an easy happy Holiday card! Gingerbread - YUM! Banners are TRENDY and so easy!! 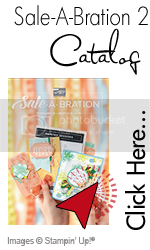 SAVE 15% when you purchase the Scentsational Season BUNDLE of stamp set and coordinating Framelits! Here is another use for Stampin' Up! 's 3-1/2" Scalloped Tulle Ribbon in the Holiday Catalog. I simply wrapped the tulle around the layer and attached it on the backside. The tulle adds a unique texture over the Designer Series Paper! Give it a try! No girly colors for guy birthday cards! This color combo is Cherry Cobbler, Basic Black and Gray. Overlapping pennants keep this card interesting! I love how the Striped Ribbon and Designer Series Paper compliment each other! I've added a NEW CATAGORY: Male Cards to my list on the right. Hope this helps you, as we all usually prefer to make flowery creations. The pennant treatment was inspired by Erika Clark of MD. Do you ever stamp on Designer Paper? Give it a try! I chose a garden themed Designer Paper to repeat the theme of the stamp. The Scentsational Season BUNDLE in the Stampin' Up! Holiday Catalog SAVES you 15%! You received SIX stamp images and SIX coordinating Framelits to use in your Big Shot Die Cutting Machine. For a quick unique embellishment, I laced Cherry Cobbler Scalloped Tulle thru the Designer Ribbon Slide. Love the Silver Glimmer Paper for a glitzy punch! Simple. Fast. Classic. This birthday wish is perfect for anyone! I love the color combo of Cherry Cobbler and Sahara Sand! Swapping ideas with other crafty gals is so fun! We all have a style and swapping E-X-P-A-N-D-S my style. I chose a trendy banner for my layout. I added a textured autumn leaf, sponged with Shimmer Paint. The shimmer shows much better in person. This Holiday card features a product "BUNDLE," which saves you 15%! We all love value! This bundle pairs the cute Scentsational Season stamp set of 6 images with the coordinating Holiday Collection Framelet Dies (set of 6)! I cut the front of the base card off, corner to corner. After layering the Snow Festival Designer Series Paper on the inside of the base card, I added a circle of white cardstock for a hand written message. The inside circle lines up with the circle on the card front. Autumn is around the corner! This is a quick simple layout with a TRENDY banner! The leaf is cut with the NEW Autumn Accents Die. Then the wonderful texture of this leaf is created with the NEW Fancy Fan Embossing Folder run thru the Big Shot Die Cutting Machine. TRY this layout! It's EASY to add shimmer to your paper creations! Stampin' Up! offers three colors of Shimmer Paint: Champagne, Frost White, and Platinum. SHAKE well. Open and fill a sponge dauber in the LID of the jar. A little paint goes a long way. Rub the dauber lightly over your paper. I looks especially lovely on cardstock that has been run through an embossing folder so it has raised designs. This leaf is sponged with the Champagne Shimmer Paint. It looks even more impressive in person! It's time to stock up on all three Shimmer Paints and Daubers for all your special Holiday creations!! Click HERE to purchase. I've been watching the Olympics and creating! Remember these sweet little fabric flowers I showed you how to make? (see tutorials at right) I made a bunch with Stampin' Up! new Floral District Designer Fabrics for a swap I'm in. I LOVE the new SILICONE CRAFT SHEET from the Holiday Catalog for all my hot glueing needs. Cooled glue POPS right off like magic!! The finished product! The fabric flower is definitely the focal point. 3-D flowers are all the RAGE!! The giant "rick rack" is the Floral District Fabric cut with the Tasteful Trim Die and my ever faithful Big Shot Die Cutting Machine! Check in Monday for another DARLING fabric idea! This is one of my favorite Big Shot Die Cutting Machine dies, the Petite Pocket Bigz XL Die. I decorated the pocket with Autumn Accents Die leaves. The back has a toggle closure. LOVE the new Bronze Buttons! They look heavy and bold, but are VERY lightweight for mailing. I used new products from the Holiday Catalog to create this fall greeting. LOVE the Woodgrain Embossing folder for the Big Shot Die Cutting Machine! I added a touch of sponging to pop the raise woodgrain. It's the perfect background for these leaves. The colorful leaves were cut with Autumn Accents Bigz Die and embossed with three different embossing folder for texture. Today the 2012 Holiday Catalog BEGINS!! Click HERE. A NEW feature is product BUNDLES!! Throughout the catalog you will find bundles of related products for 10-15% savings - hurray!! Above is the Ornament Keepsakes Bundle containing the Ornament Keepsakes Stamp Set of 9 images and the coordinating Holiday Ornaments Framelit Dies for the Big Shot Die Cutting Machine. So fun! So handy!